One of the benefits of joining other Volkswagen enthusiasts especially during a teh tarik session is that I get chances to test drive other member’s cars. One of them, which I managed to sneakily test drive a number of times was the Scirocco 1.4. Now I have always been curious to see a car with the same engine as the Golf 1.4 TSI, but priced at RM188,888 has to offer. The Scirocco was also featured in the recent Karate Kid movie but of course, it’s an extremely old version. Also called the Roc for short, here is a quick and brief history of the Scirocco. So let’s see what are some of the differences here. 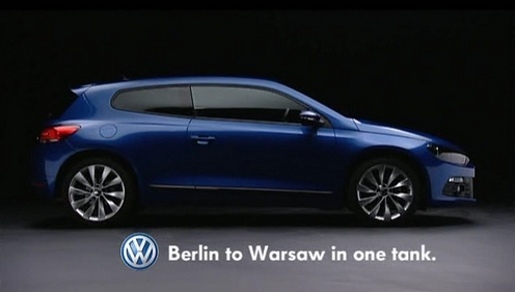 Right off the bat, the moment anyone looks at a Scirocco, I am sure there has to be a reaction. Whether it may be a good one or a bad one but still a reaction. Perhaps you might be like James May where he might have a fizzy little thing between his legs when he sees a car which gives him the fancy, yeah, something like that but irregardless, it definitely turns heads. The first time I actually saw a Scirocco was when Top Gear featured an episode on it where they had to come up with an advertisement for the 3-cylinder diesel version of the Roc (you can view their silly results here and here). From other Roc owners, you can still set up a baby chair in the Roc and it comfortably fits 4 people in total due to its 50/50 split folding rear seat design (you can squeeze in 5 for short trips but it wouldn’t be legal as there are only two rear seat belts available). One thing that stands out between the Roc 1.4 and the Golf is that the Roc comes with a flattened steering wheel, the same one which is given for GTI and R owners. The Golf 1.4 comes with the standard round steering wheel which also is available with the Passat CC sold here. Shown above is the flat bottom steering wheel designed for the R-line cars. The GTI ones look exactly the same except that it has red stitching on it. Another thing to note that Scirocco’s that were manufactured in 2009 have a completely different interior than the current ones mainly because it takes the same styling from the older Golf MkV. The ones sold here by Volkswagen Group Malaysia are based off the newer interior but I have seen 2009 Rocs for sale on Mudah brought in by the local dealers. The rest of the interior is standard and there isn’t much differences between this and the Golf. In my opinion, the steering wheel itself provides a nice sporty look and feel and to optionally get this steering wheel itself can cost around USD$500 (searching through eBay). The boot however, is surprisingly deep and you definitely can store a lot of stuff in there. I haven’t had the chance to test it out with my full-sized golf bag but it definitely does look like it has a lot of space. Another benefit you get with the Roc 1.4 is that it comes with 17″ rims as it’s standard compared to the Golf’s 16″ rims. So far there hasn’t been any complaints as well for the Roc owners especially when it comes to the “rattling” noise experienced by Golf owners especially when taking the corner. This issue actually comes from the fact that the rubber lining along the doors tend to dry up in our weather, hence the noise. Because the Roc has only two doors, I guess you can hardly hear the sound. After taking off in the standard fashion and the moment I enter the first corner, or basically, leaving the mamak stall and turning the first corner; the Roc shines here. Due to it’s lower profile, this car handles way better than the Golf 1.4 which I think is a little soft around the suspension areas. You get the planted feel when tackling corners and I could hardly feel the side G’s pushing me. Of course it does help that it’s only a 2-door car hence you get less body roll due to a more rigid and firmer chassis. Other differences between the Roc and the Golf are rather miniature in nature. For example, the Roc doesn’t have sensors at the front but only sensors at the back as compared to the Golf which has sensors all around. The Roc however has two reverse lights versus the rest of the other VW cars mainly because I think the rear window is so small and the C pillars are so fat, that it is extremely difficult to reverse out. Of course with every VW car, comes plenty of modifications. Here are some of the mods you can do for the Scirocco to stand out from the rest of the other Rocs. Bodykit (Rieger, Caractere, etc, etc) – This of course changes the look of your car! Aluminium pedals for the Roc 1.4 as well as the OSIR footrest or you can opt for the full R-line pedal sets. Unibrace for the Roc to improve its handling further. I am not too sure if they have the Crossbrace for the Roc as well. Head unit upgrade to either the RCD510 (the Roc 2.0 comes with this) or the RNS510 which offers satellite navigation and DVD playback. So far there hasn’t been any announcement by VW to provide daytime running lights for the Scirocco. To conclude up this review, would I say that the Scirocco is worth the extra RM30,000? Well it all depends on your taste. If you like a 2-door car, then yes, I would say it would be worth the RM30,000 extra. But if you are considering the 2.0litre version, I still have some doubts mainly because a 2-door Renault Megane RS is priced currently at RM236k which is RM15k cheaper than the 2.0 Roc and it has a lot more features to the car. Overall, the Scirocco fits into a different segment compared to the Golf hence I guess it’s a nice compliment in their line up. The Roc which I tested was a very unique Roc, because the owner, decided to bring it in for a dyno run and the results were astonishing. The Scirocco 1.4 TSI is stated to provide an output of 160ps running on Ron98 but his Roc managed to generate 170horses at the wheel, yes, 170whp! That is insane! By the way, there is currently a Scirocco R in Malaysia already. Apparently someone managed to bring it in via a local AP and it made an appearance at the Volkswagen Club Malaysia’s TT session two weeks ago. So far no concrete rumours about Volkswagen Malaysia launching the Scirocco R but there has been changes in terms of the prices for the Golf R. What I have heard is that the prices have been raised from the rumoured RM270k+ to RM300k+. Previous postCalling all VW Owners! Next postNuffnang’s 6th Blog Day! Nice review,awesome car. Volkswagen will always be the best car for me and my family.I have 1 kid and my wife.Which really suites us to the beautiful car.Thanks for sharing this review.